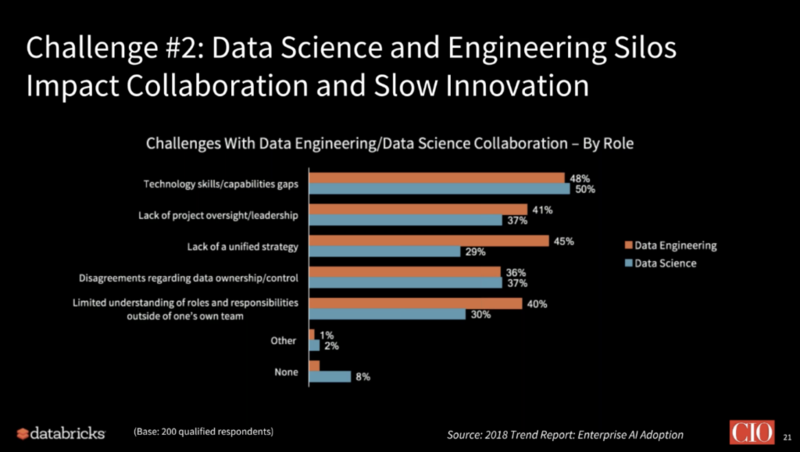 We recently hosted the webinar — CIO Survey: Enterprise Challenges to AI and How to Overcome Them — featuring Jen Garofalo, Research Director at IDG, the parent company to CIO.com, and Pat McDonough, VP of Customer Success at Databricks. This webinar covered key findings from a recent CIO.com survey of 200 executives on the topic of AI adoption and the challenges inhibiting program success. The survey and report focused on the rapid growth of AI across industries to fuel new and innovative use cases ranging from accelerating drug discovery through genomic medicine to powering intelligent recommendation engines that delight and engage customers. As Garofalo highlighted in the webinar, the survey showed that 90% of companies are investing in AI-related technologies. In fact, enterprises worldwide are expected to invest $185 billion in big data and analytics, AI, and cognitive solutions by the end of 2019*. But Garofalo was quick to point out that although AI is the hottest trend in technology, the pace of actual adoption and deployment is a different story. Most notably, she cited that only 1 in 3 AI projects are successful. This means that the greater majority of projects are not being completed on time, are exceeding expected budgets, and are not yielding the expected outcomes. The survey results found that 96% of companies cite data-related challenges with AI projects. These challenges have a direct impact on the amount of complexity in delivering an AI solution to production — with an AI project taking an average of 6 months to complete. Interestingly, more than half of that time is typically spent on data preparation activities. Another contributor to AI projects getting stalled is the inherent silos between and among data science and engineering teams. 80% of teams cite collaboration as a challenge with technology skills gaps and project management and oversight as the primary drivers of this divide — resulting in communication breakdowns and friction that slow productivity. As AI continues to evolve, the number of frameworks and tools available are increasing at a rapid rate. 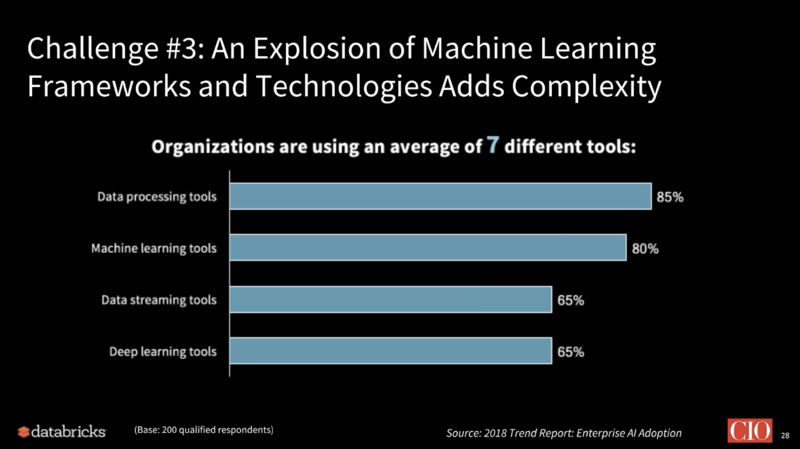 Garofalo cites that organizations are using an average of 7 different tools across data processing, machine learning, data streaming, and deep learning. This fast-moving technology landscape is adding enormous complexity to the overall process, hindering companies who don’t have the expertise and resources to take advantage of the latest available frameworks and tools. The webinar not only highlighted the drivers and challenges of AI adoption but also offered tips to overcome these challenges. Pat McDonough, VP of Customer Success at Databricks, shared stories and experiences from a number of our customers including Overstock.com, Regeneron, and Riot Games and the best practices they have employed to help them extract benefits from their work around AI. Leverage the cloud to simplify infrastructure, reduce on-prem costs and provide the elastic scale your teams need to meet the demands of modern analytics workflows. Make data and the output of the data (e.g. models) available to all teams to foster transparency, collaboration and productivity. Focus on providing the necessary architecture and scaffolding so your teams can leverage the best ML tools and frameworks to drive innovation. If you would like to learn more about the other best practices, watch the webinar on-demand. 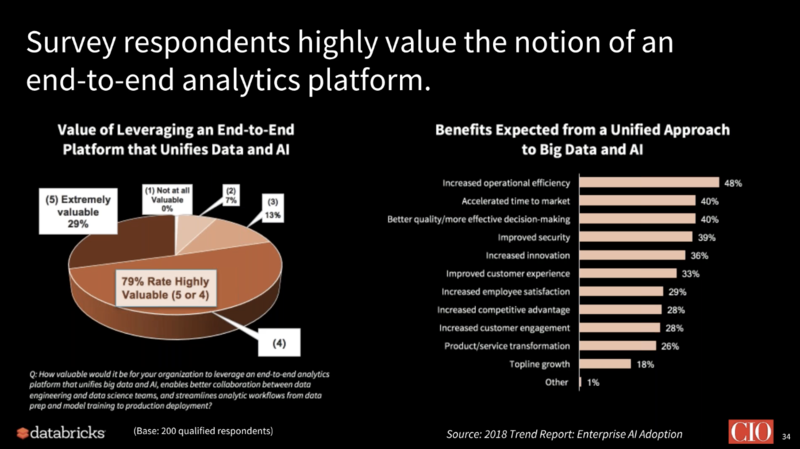 A final takeaway from the survey results that Garofalo shared was that most companies echoed a common theme: the importance of a unified approach to data and AI. By bringing together teams and data workflows the expected benefits include increased operational efficiency, accelerated time-to-market, increased innovation, and more. 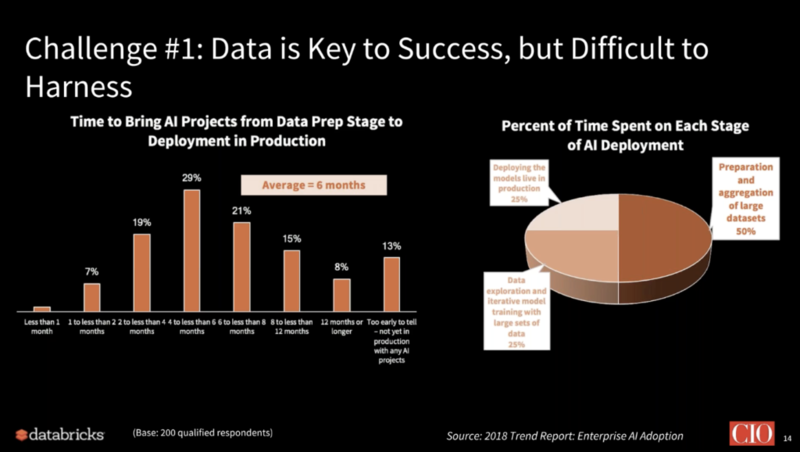 If you weren’t able to attend the live webinar and would like to learn about all of the best practices to ensure AI success, click here to watch the webinar on-demand. You can also download the full report “2018 Trend Report: Enterprise AI Adoption” based on the CIO Survey by IDG/CIO.com.